If you like your clays in both polymer and metal, take a look at the work of Ohio artist Pat Bolgar. Her complex combinations mix materials, colors and shapes in rich and appealing ways. Her mixes engage the eye as she brings color to metallics and, at the same time, adds metallics to polymer. 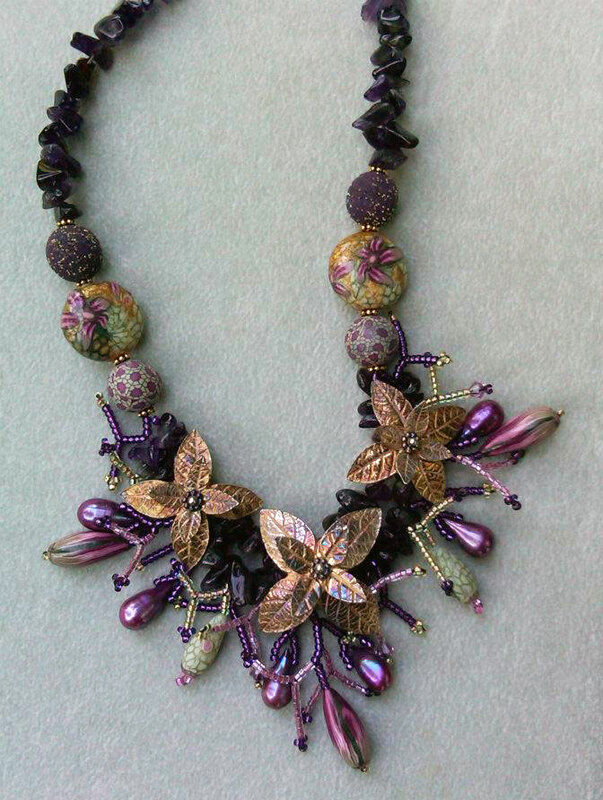 Pat is featured in the new Metal Clay and Color book and she’s added updated photos on her Facebook page. You can also tour her cabin-in-the-woods studio on Facebook. That is gorgeous in color, in design, in materials. Fantastic! work her colors and the metal make the perfect combination for her beautiful work. Thanks Cynthia, It was a thrill to find my necklace here this evening. I’m so excited about the book Metal Clay and Color. It looks like a good one. Wonderful work! So beautiful colors!!! I <3 it! Wow! Spectacular color, texture and layering of elements! A very natural, organic beauty. Pat is not only a great polymer artist she is also a nice person. I get the pleasure of chatting with her every year when she comes to WinterFair. She has definitely achieved a distinct ‘voice’ within our community. Pat is a dear friend whose work never ceases to amaze me. I consider myself really fortunate to own some of her fabulous pieces. She just gets better all the time!